A health worker monitors the temperature of a traveler from the Democratic Republic of the Congo during the Ebola outbreak that ended in July. The virus has now surfaced in another part of the country. The Congolese health ministry made the announcement this week, stating that at least 26 people have fallen ill with what appears to be hemorrhagic fever near the town of Beni and 20 have died. Laboratory tests have confirmed that four of the patients were infected with Ebola. North Kivu is a lawless, mineral-rich area in the northeast of the country, close to the border with Uganda. 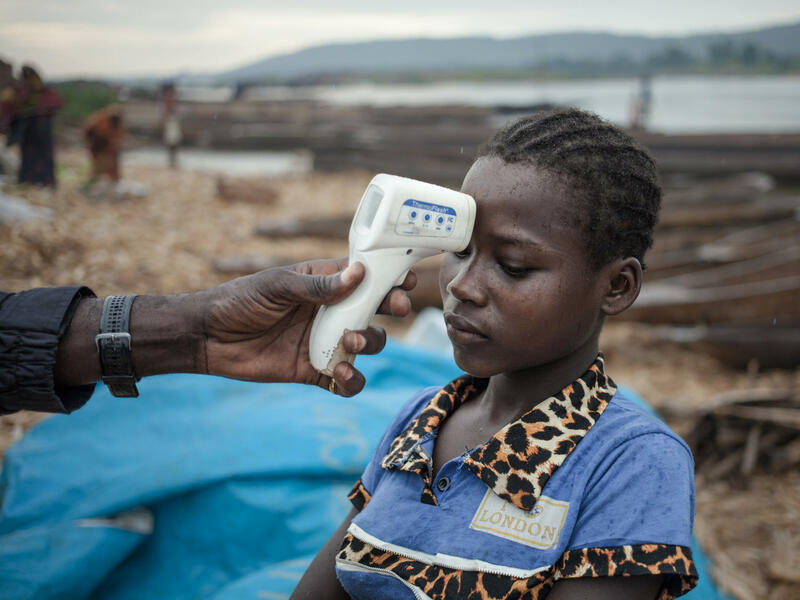 The previous outbreak in Equateur province was 1,500 miles away in the northwest of the DRC near the Congo River. "This new cluster is occurring in an environment which is very different from where we were operating in the northwest," says Dr. Peter Salama, head of emergencies for the World Health Organization, in a statement. "This is an active conflict zone. The major barrier will be safely accessing the affected population." Over the last decade armed groups in North Kivu have massacred civilians and each other while vying for control of the province's deposits of gold, diamond and coltan, an ore used in cellphones and other electronics..
Michelle Gayer, director of emergency health for the International Rescue Committee, oversaw a team of clinicians, nurses and sanitation engineers from IRC sent to help with the Equateur outbreak. She's now planning to send some of those same staff to work on the North Kivu flare-up, which she says will be far more complex than the last one. "This is an area where there's been a lot of population displacement because of conflict," she says. "Routes may be cut off. We may not be able to get supplies into certain places. We may not be able to travel at certain times of the day or evening. And just in general the security of our staff is definitely a problem." Gayer knows this region well. Her aid agency already works with 61 health clinics spread across the province. "In these sorts of zones where people don't want to go, it's always going to be harder even just to hire a car," she says. "So that will delay things and will make it more expensive. We just need to be prepared for that." Nearly a million people in North Kivu have been forced from their homes by the violence. Gayer says that general living conditions for many of the displaced are poor, making it even harder to mount an Ebola response. "Don't be surprised if there's a cholera outbreak in the middle of this as well because the risk factors are there," she says. "It [North Kivu] has been in this humanitarian situation for so long the health status of people is much worse. Vaccination coverage is less. There are nutritional problems. The water and sanitation is worse. So it's not just the security. It's everything." But she adds that the good thing is that the DRC and international health agencies are gaining experience with this disease. The Equateur outbreak, which was declared officially over on July 24, was controlled fairly quickly and only 36 people died. The West African outbreak that raged in 2014 and 2015 sickened nearly 30,000 people and claimed more than 11,000 lives.